Is it just another example of Pareidolia kicking in? An image taken by NASA rovers on the surface of Mars shows what appears to be an object eerily resembling the ancient Egyptian Ankh Cross. Mars anomaly hunters have discovered countless images that have since remained unexplained on the surface of Mars. The Ankh Cross on Mars is bay far one of the best. While most of these objects are nothing more that Pareidolia— a psychological phenomenon in which the mind responds to a stimulus by perceiving a familiar pattern where none exists—some other discoveries push the limits of rationality to the limits. In the past, Mars anomaly hunters have found Pyramids, domes, walls, and even ‘alien creatures’ in the countless images sent back by NASA rovers from the red planet. However, the Ankh Cross ‘apparently’ found on Mars takes Martian anomalies to a whole other level. Other objects discovered on Mars resemble artifacts that we see all around us on Earth. These alleged ‘discoveries’ may or may not be real, and you must always approach such things with a certain degree of skepticism. After all, its Mars we are talking about. How cool would it be if we did find ACTUAL traces of a lost civilization on Mars? Interestingly, the truth is that Mars has given us a lot to talk about. We have come to understand that Mars was not a desolate world always. In fact, experts have discovered that in the distant past, Mars was almost identical to Earth: with rivers, lakes, oceans and an atmosphere that resembled the one our planet has today. However, when talking about the possibility of lie on Mars red flags are raised by skeptics who say Mars was never inhabited. Pareidolia or not? What do you think? Interestingly, there are some scientists who disagree. Dr. John Brandenburg, who has a PhD in Theoretical Plasma Physics from the University of California at Davis, and works as a consultant at Morningstar Applied Physics LLC and as a part-time instructor of Astronomy, Physics and Mathematics at Madison College, and other learning institutions in Madison, Wisconsin, believes hat in the distant history of Mars, when the red planet was much more similar to Earth, advanced alien civilizations developed there, and evidence of their existence can be found on the red planet today. Curiously, recently declassified documents by the CIA mention Pyramids and a lost civilization on Mars. So what if in the distant past aliens did inhabit Mars, and massive global cataclysm wiped them out as some suggest? We probably would find evidence of their existence today. Mars Anomaly hunters—and apparently some scientists as well—claim that the evidence is there, and the countless image sent back by NASA rovers prove that the “Ancient Martian Civilization theory” is not just a conspiracy. The Ankh Cross is also known as crux ansata (the Latin for “cross with a handle”) is an ancient Egyptian hieroglyphic ideograph with the meaning “life”. The Egyptian gods are often portrayed carrying it by its loop or bearing one in each hand, arms crossed over their chest. The ankh appears in hand or in the proximity of almost every deity in the Egyptian pantheon (including Pharaohs). As noted by Richard Cassaro, the Ankh Cross has even been found to exist in Mexico, far away from the land of the Pharaohs. The mystery objects can be seen at Calixtlahuaca, present day Toluca. It is considered by many authors as one of the most mysterious objects discovered in Mexico. The Monument number 4, Cross Altar or Tzompantli shares an incredible similarity to the Ankh cross in ancient Egypt. As you can see, the Ankh Cross can be found all over the planet, its meaning is powerful, and it was an important symbol for thousands of years. Now—apparently—the symbol can also be found on Mars. Whether its Pareidolia or not, finding something like that on Mars is certainly interesting. 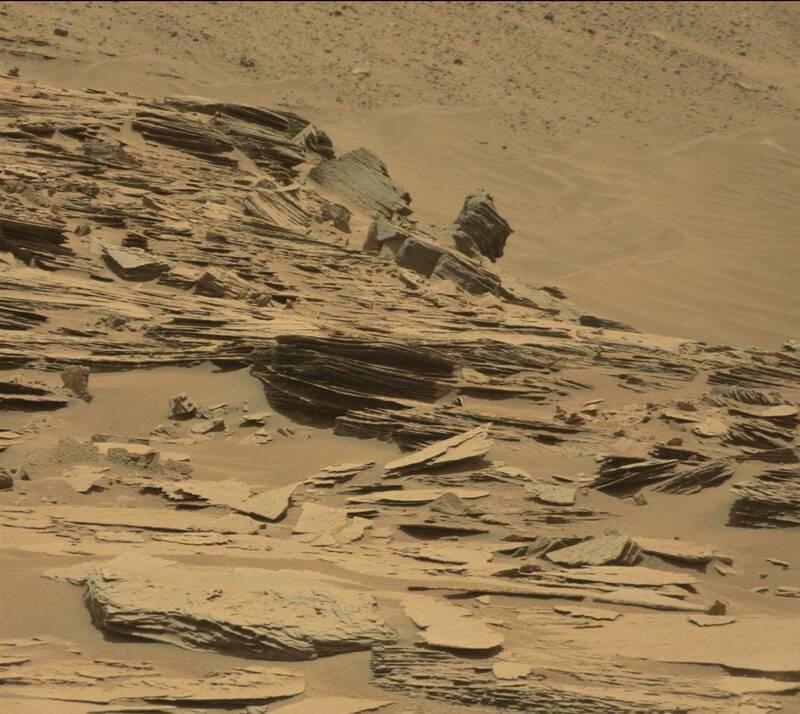 The original image can be found here: http://mars.jpl.nasa.gov/msl-raw-imag..